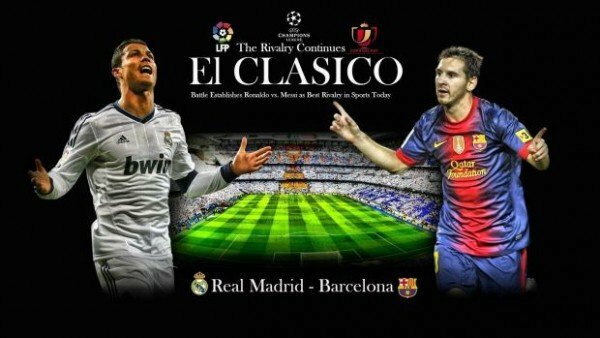 This Sunday at 21:00 CET all football fans will be in front of their screen, because for next 90+min it is one of greatest derby in world – El Clasico. For those that still don’t know what El Clasico is, El Clasico is a clash between two biggest clubs in Spain and maybe in world – Real Madrid and Barcelona. According to transfer market the total value of players that will be playing this Sunday will exceed €1 billion, Real Madrid is worth around €571 million and Barcelona around €588 million. This game will also be a clash between top four players that are holding top market value in football. For Real Madrid that will be Cristiano Ronaldo (€100 million) and Gareth Bale (€80 million) and for Barcelona we got Lionel Messi (€120 million) and Neymar (€60 million). So except the regular name for this game El Clasico, we can call this game the dance of the millions. At start of this season Real struggle especially in Liga BBVA, at one point they were huge 10 points behind the leaders. But Italian boss Carlo Ancelotti manage to set all pieces together and Real started to play their game, pretty offensive with a lot of scoring chances. The result of that kind of play is more than 2 (2.75) goals per game and now they have the second best attack of Liga BBVA (behind Barcelona). Maybe one more interesting thing is that last defeat that Real have suffered in any competition is against Barcelona in last El Clasico (26/10/2013). After that game Real played 31 games and won 26 of them. Carlo Ancelotti will not be able to count on Sami Khedira, Alvaro Arbeloa and Jese for this game, but Sergio Ramos is coming back from suspension. Cristiano Ronaldo is playing maybe the best season of his career and he is without doubt best player for Madrid and he is also holding the leading goalscoring in the league with 25 goals from 24 appearances. Gareth Bale has amassed the most assists, knocking up 10 so far. Start of the season was quite the opposite from Real Madrid, Barcelona was dominating and crushing their opponents, clear leaders of Liga BBVA. But as the season went on their defence started to be thinner and thinner due to injuries, at one point Gerardo Martino had to use Sergio Busquets as central defender. But even with all those problems Barcelona still managed to keep the pace on all fronts. The only mistake was a defeat against Valladolid two matches ago (0-1). But even without their defenders Barcelona have still got the second best defence in Liga BBVA, they conceeded only 21 goals from 28 games. Isaac Cuenca is out of this game due to injury and Barcelona captain Carles Puyol is questionable whether he fit to play. The good thing for Barcelona fans is the return of Gerard Pique from injury, so it’s expected that he will take his place as one of central defenders. What Cristiano Ronaldo is to Real Madrid, Lionel Messi is to Barcelona. He has the best ratings and is the club’s leading goalscorer this season. with Cesc Fabregas recording 12 assists so far. Real Madrid and Barcelona have played 225 matches so far and Real is slightly better off with 90 wins, Barcelona have got 87 wins and 48 games ended in draw. If we look at the games that were played only at the Santiago Bernabeu, from 111 games Real won 63 (57%) of them, 25 (23%) games end in draw and Barcelona won 23 (21%) games. In recent history (last six games) Real have won three of them, two games ended in a draw and Barcelona have won only one (last one). If we narrow it down to home vs. away then it’s a tie, both clubs have 2 victories and 2 game ends in a draw.